The 2018 Renegade RV XL Class C luxury diesel motorhome is luxury redefined with first class amenities that provide the best in comfort and entertainment. Renegade XL is the perfect blend of luxurious finishes, spacious floorplans and legendary quality. Powerful and refined, the XL takes you wherever you long to go with unmatched safety, style and comfort in models ranging from 40’ to 45’ in length. 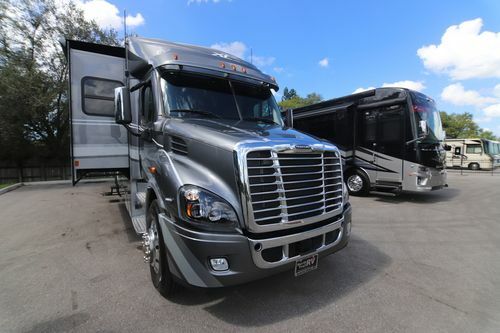 With Renegade XL, you have the choice of several popular chassis options…Freightliner Cascadia, Volvo VNL, and Lonestar by Navistar, with engine horsepower ratings from 500 to 600 HP. 3 Color Full Body Paint. Optional: Dishwasher and much more! This is a partial list of the The 2018 Renegade RV XL Class C diesel motorhome features and options. For a complete and exact list of standard features and options please call us and ask to speak to a North Trail RV Center RV Sales Consultant. North Trail RV Center is not responsible for any errors or omissions listed here.